Peace and quiet immersed in the Arcadian hills of Segesta. 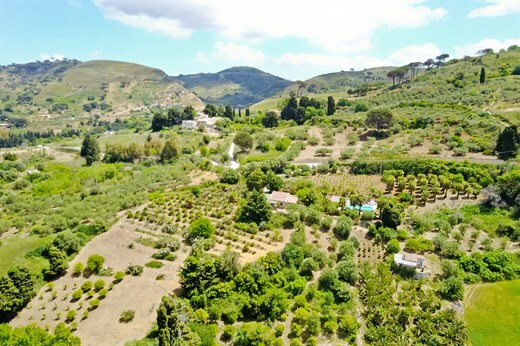 Set amongst a patchwork of vineyards and olive groves near the majestic Doric Temple of Segesta, Egesta is a simple country summer house with a great pool and the kind of peace and quiet that inspires complete and total relaxation. If you manage to drag yourself away, the beaches at Castellammare del Golfo and Scopello are within easy striking distance. Pool open from Easter to the end of October. Inside: Egesta comprises two houses separated by luxuriant grounds full of fruit trees, palms, roses and olive groves. The main house entrance takes you in from a large shady terrace into a small but comfortably furnished and welcoming open space comprising a living area with fireplace, a dining table and a well-equipped kitchen. A short corridor leads from here to a cosy double bedroom and a shower room. The summer house, which is accessible via a path through the gardens, is about 80m away from the main house. Here there is a spacious double-twin bedroom with a kitchenette, a bathroom with tub and handheld shower, and a private terrace with wonderfully calming views. Outside: the main house is surrounded on two sides by a large covered terrace, which is equipped for lounging, dining and cooking. It is here that you will spend most of your time when away from the super pool, which is situated about 20m away from the main house. The pool area has plenty of shade, while the pool itself boasts both a Jacuzzi corner and a swimming pump. The well-tended, mature gardens are planted with a wide variety of fruit trees, including cherries, apricots, plums, figs, pears, lemons and grapefuit, ensuring fresh fruit all year round. No less important are the olive trees, which produce the owner's excellent organic olive oil, a bottle of which you will receive on arrival. The summer house has its own shady terrace which, like the rest of the grounds, looks out over the gently undulating Arcadian countryside that so typifies this area of Sicily. In the distance is the historic hilltop town of Calatafimi. Egesta is ideal for 1 or 2 couples travelling together. The two houses on the property are never let out separately. Due to the presence of two fairly deep unprotected water ponds in the grounds, we do not recommend this property for families with children under 7 years of age. In any case, children staying at Egesta should be supervised by an adult at all times when exploring the grounds. Please also be aware, if you have children, that Egesta’s two bedrooms are in separate buildings situated about 100m from each other. Egesta is a couple of miles from the charming, historic town of Calatafimi and due south of the coastal town of Castellammare del Golfo and the charming village of Scopello. This is an area of great historical interest. The Elymians built the City of Segesta here before the arrival of the Greeks in the 8th Century BC. The temple and amphitheatre of Segesta are just a few miles away and absolutely not to be missed! Also close by are a series of thermal baths that the Elymians would have used. The closest beach is at Castellammare del Golfo, a 30 minute drive away. Egesta is also very well situated for the historical towns of Erice, Trapani and Palermo. And why not take a walk in Lo Zingaro Nature Reserve, or a trip out to the Egadi Islands whilst you are there. All in all, Egesta is very strategically placed indeed. "Egesta is truly one of the best holiday experiences I've had. The setting is idyllic and the grounds and pool were of the best I've experienced. Egesta will long stay in my memory." Egesta had everything we needed and more. It was private, the gardens were wonderful and we were encouraged to pick any in season fruit and flowers during our stay. The pool was wonderful. The villa owners couldn't have been more helpful. The welcome pack they provided was amazing, certainly enough for a couple of meals. They recommended places to visit and restaurants and came to say goodbye to us the evening before we left and were very friendly and helpful. All good. Egesta is truly one of the best holiday experiences I've had in many years. The setting of the property is idyllic and the grounds and pool were of the best I've experienced especially if you enjoy cooking, as the herbs were plentiful not to mention the fruit trees and vines. It's a beautiful rural setting that's extremely relaxing but still within easy driving distance of many places of interest to visit and a good choice of beaches. The owners of the property were extremely kind and gracious and I felt that they were there for us should we need them at all. This property will long stay in my memory. We had a wonderful fortnight, which allowed us both to relax and revive. The tranquillity and privacy of the villa were the key ingredients in achieving this, not least the beauty of its rural setting, the wonderfully spacious swimming pool facilities and the comfortable veranda looking towards Calatafimi. We knew in advance that the villa was on the smaller size in terms of space. However, it was extremely comfortable and well equipped. The kitchen was tremendous with a fine gas oven and every cooking utensil one would ever need. We made splendid use of the barbecue. The swimming pool was sensational, not least its spa facility and water jet. The owners were wonderfully helpful and welcoming, whilst respecting our privacy. We enjoyed two excellent in-villa meals, which were absolutely delicious. The fish menu was particularly good. The swordfish steaks were delightful along with the seafood pasta dish. Once again, a fantastic villa, and amazing experience. We return after two weeks feeling like we had one month holiday, which is pretty rare to achieve. The villa strikes the right balance between simplicity and modernity. It embraces its connection to nature and yet everything is there to ensure you are still connected to reality and modern life if you need to be. The villa has been improved since 2014 and this was a definite surprise as we had not expected this. The location, views and peacefulness are excellent. We have spent 5 weeks there now and will doubtless return. The owners are extremely friendly and helpful. The pool area is beautiful and the abundance of fruits in the grounds overwhelming. The owners were fabulous, kind and friendly and really helpful, also discreet. We loved the pool, the pizza oven, the grounds, all the fruit trees and fruit available, the little villa in the grounds. Egesta was superb... we had a fabulous experience. The cook was fantastic and we had a superb seafood menu on the Sunday night. Everything we could have wanted was provided and the owners were helpful and very friendly. The outdoor wood fired oven was brilliant and we made our own pizza. Owner very welcoming, welcome pack above and beyond anything we'd ever had before in other villa companies... The pool was exceptional, as were the views and grounds, with fruit trees laden with fruit. A great place to escape from the hassles of modern day life. The villa was beautiful. The owners were so kind. The cook came 4 times and was wonderful, her food is delicious. We loved the sound of the goats coming past the house twice a day. The pool is just stunning. stunning, stunning, stunning. Egesta is always so wonderful. This is our fourth year going there. The staff are so great and the place is so beautiful. We love the working kitchen. They take so much care to be sure that everything is perfect from the fabulous pool to internet. We will be back. Peace, quietness and beauty of the surrounding, that’s what we were looking for and villa Egesta delivered more than what we expected in all areas! Our two daughters enjoyed very much having their own detached house and Egesta has amongst the best swimming pool we ever enjoyed. Thanks to the owners for their warm welcome. Perfect for us... we loved the place. Totally relaxing, quiet, rural, everything you need to unwind. We had a lovely time thank you! The setting of the villa was beautiful. The seclusion and peace were just what we were looking for. The villa had all the facilities we needed. The pool area was excellent and definitely the best we have been to... It was a really lovely and relaxing holiday. Idyllic. Remote, bringing spectacular privacy and tranquility. No better place to relax/unwind. Fantastic location, views and pool. What we enjoyed most? Our villa and the weather. A terrific place in a beautiful valley. Beautiful place... The Thinking Traveller is a class act. The owners of Egesta are first rate indeed. They greeted us upon arrival and had stocked the house with essentials such as milk, cheese, bread, olive oil, vinegar and fruit. They also had a light lunch ready along with some complementary wine. They truly made you feel that their house was your house. The facility was very adequate and well located so we could easily make day trips to Erice, S, Vito lo Capo, Palermo, Monreale, Trapani and Selinunte and still be home to make dinner in the evening. The town of Calatafimi-Segesta is very interesting and we spent time walking around, shopping and speaking with locals...Truly a memorable experience. We have never encountered such engaging owners in any of the rentals that we have had throughout Italy. Didn't want to leave. Sooo peaceful and hidden away! Great pool and we loved trying the wine and cheese made just down the road...! Villa Egesta is paradise on earth. owners are delightful and couldn't do enough for us - we felt like honnoured guests in their home.